In this die set, you get two small coral dies. 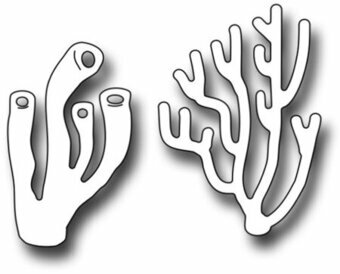 The pipe coral measures 0.75" x 1.2", and the stag coral measures 0.95" x 1.3". These are perfect additions to any Under the Sea scene. Sue Wilson Dies - Atlantic Ocean Collection - Bermuda. This whole collection has a modern feel to it and would work well with male projects too! This one includes a scallop-leafy-look to the outside layer. Lots of dies are included for added flexibility and layering options! 6 dies. Sizes: Smallest: 2.45" x 1.20", Largest: 4.53" x 3.78". An elegant collection of high quality steel dies designed to coordinate with each other. Sweet sea horses are the most unique creatures of the deep. 1-1/4" X 2-3/4". 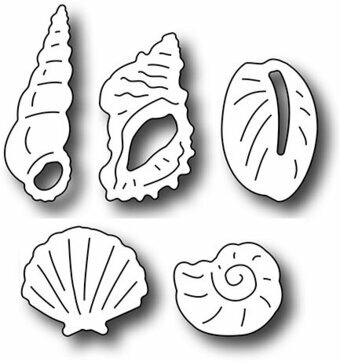 Five tiny seashells measuring between 1/2" and 1". These tiny seashells pack a lot of detail. Color them with soft shades of ivory and off-white. They will be perfect to adorn a summer beach card! This darling jumping dolphin die measures 2.5" x 1". Seven fish and sea creatures perfect for any maritime scene. 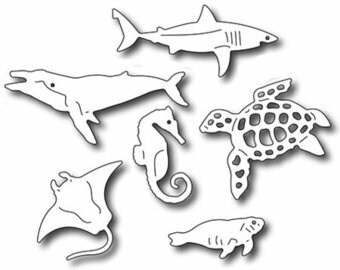 These dies measure between 1" and 1.9", and include a whale, shark, orca, sting ray, seahorse, sea turtle and manatee. Enjoy!! Ocean themed craft dies featuring a jellyfish and a starfish. So Jelly Lawn Cuts coordinate with the stamp set So Jelly. A wonderful stencil background of bursting ocean waves, perfect for your summer projects. Stencil measures 4-1/4' X 5-1/2". The starfish is 2" x 2", the scallop is 1-1/2", and the spiral shell is 5/8" x 1-7/8". These dies are compatible with most tabletop die cut machines. Craft die from Memory Box featuring an oval filled with fish. This is a set of seven dies. The seashells are around 5/8 inch, the starfish is 1 inch. These are US-made steel dies compatible with most table-top die cutting machines. 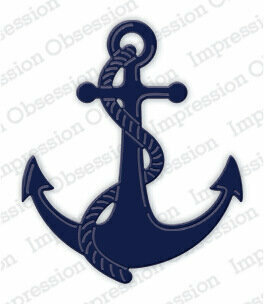 Impression Obsession craft die featuring a ship's anchor. This is a single die measuring 2-1/4 x 2-3/4 inches. These are US-made steel dies compatible with most table-top die cutting machines. 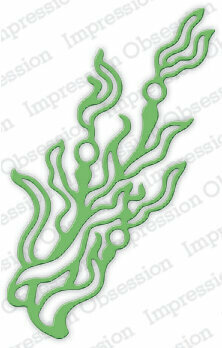 Ocean themed Impression Obsession craft die featuring Sea Kelp. These are US-made steel dies compatible with most table-top die cutting machines. This is a single die measuring 2-1/8 x 3-1/2 inches. Nuvo Crystal Drops adds three dimensional pearly beads quickly and easily in various sizes to every craft project, the perfect finishing to any product. Ocean themed Impression Obsession craft die featuring sea shells. These are US-made steel dies compatible with most table-top die cutting machines. This is a single die measuring 1-1/4 x 4 inches. Stickles Glitter Glue. 0.5 ounce. Embellish paper crafts and rubber stamp projects with brilliant glitter colors without the mess of working with glitter and glue. Easy to squeeze bottle features a continuous flow fine tip, perfect for lettering and detail work. Available in a wide variety of colors in a clear drying base, all non-toxic and acid-free. 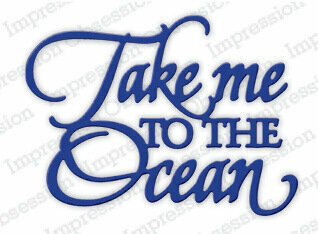 Impression Obsession craft die featuring the sentiment "Take Me to the Ocean". This is a single die measuring 2 x 2-3/4 inches. These are US-made steel dies compatible with most table-top die cutting machines. Craft die featuring a ship's anchor. Xcut boasts a comprehensive range of designer dies, all made from the highest grade carbonized steel and are tested to deliver a superior cut. 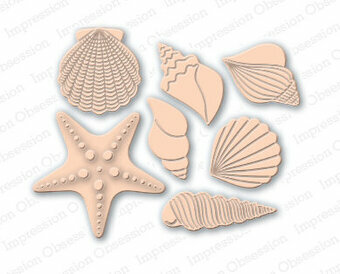 Boost the appeal of beach-inspired paper crafts with this 4.25 x 5.75-inch waves embossing folder. Pair it with blue or green heavyweight card stock and most any embossing machine to imprint a stunning water-like background. 100% steel craft die from Memory Box. For use on cardstock, felt, and fabric. Cut, stencil, emboss, create. Use in most leading die cut systems. 2 x 4.8 inches. 5.1 x 12.2 centimeters. 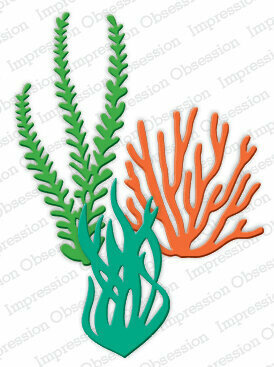 Craft die from Impression Obsession featuring seaweed and coral. This is a set of 3 dies measuring 1-1/4 x 2-1/2 inches, 1-1/2 x 3 inches, and 2 x 2 inches. 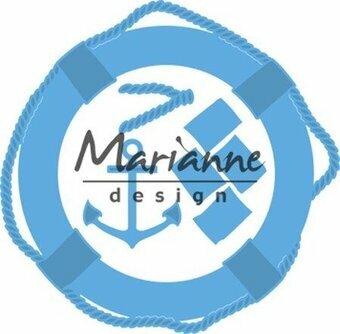 This CottageCutz die features a nautical theme with an anchor and rope. CottageCutz are thin metal dies, like a QuicKutz. They are easy-to-use and add great detail to any craft project. This die is compatible with the following machines: QuicKutz Squeeze, Revolution, Sizzix / Ellison Big Shot, BigKick, CuttleBug, SpellBinder Wizard and Accucut Zip'eMate. Adapters/shim may be required on some machines. Made in the USA. 100% lead free. Craft die from Memory Box featuring ocean seaweed. 0.4 x 4.2, 0.2 x 3.3, 0.6 x 2.9 inches. 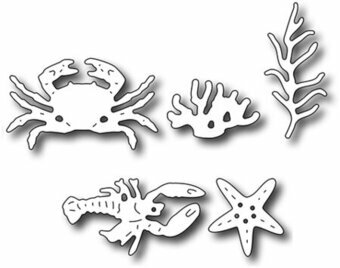 This set of nautical dies is a perfect base for all your beach themed projects. Includes 4 pcs; 5.1 x 5 in. Let's go scuba diving and discover the treasures of the ocean floor! You'll find a crab, lobster, starfish, coral and kelp. These 5 dies measure approx. 0.7" to 1.3". 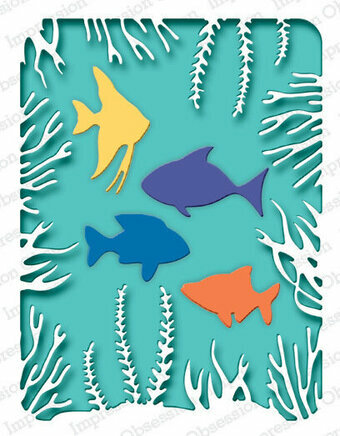 An underwater scene to use as a background with any of our sea life stencils or stamps. Design area measures approximately 4-1/4" X 3-1/4". Beautiful watercoloured background papers in a variety of colours including: greens, blues, red, pinks, purples and mixtures. A5 size = 6" x 8.25". 32 sheets; 4 x 8 designs. 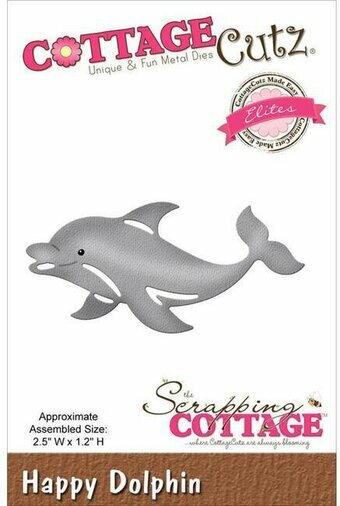 CottageCutz die featuring a happy dolphin. CottageCutz are thin metal dies, like a QuicKutz. They are easy-to-use and add great detail to any craft project. This die is compatible with the following machines: QuicKutz Squeeze, Revolution, Sizzix / Ellison Big Shot, BigKick, CuttleBug, SpellBinder Wizard and Accucut Zip'eMate. Adapters/shim may be required on some machines. Made in the USA. 100% lead free. This CottageCutz die features a Sea Turtle. CottageCutz are thin metal dies, like a QuicKutz. They are easy-to-use and add great detail to any craft project. This die is compatible with the following machines: QuicKutz Squeeze, Revolution, Sizzix / Ellison Big Shot, BigKick, CuttleBug, SpellBinder Wizard and Accucut Zip'eMate. Adapters/shim may be required on some machines. Made in the USA. 100% lead free. Craft die from Impression Obsession featuring a small sea crab. This is a single die measuring 1-1/2 x 2-1/8 inches. 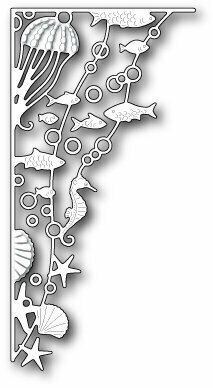 This stencil features under the sea elements like sea horses and shells. Includes 1 stencil. Size: 6 x 6 inches. 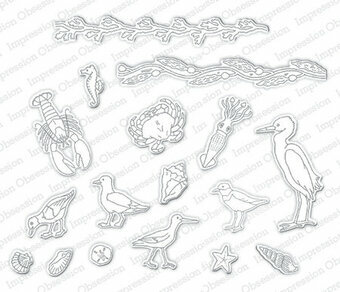 Charm your papercrafts with a nautical addition! 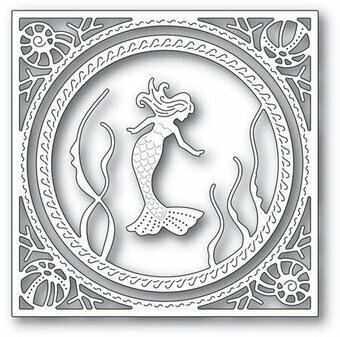 Our seaworthy embossing folder features ten anchor designs that are characterized by hand drawn style. 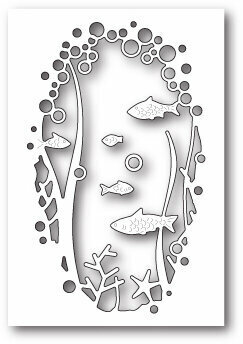 From outlined to bold, this anchor embossing folder can be used in its entirety, or individual pieces can be cut out after embossing to personalize projects just the way you'd like. 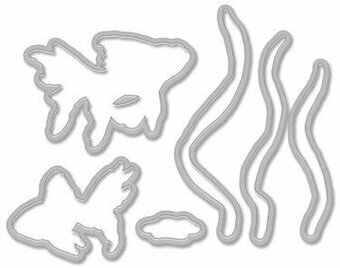 Anchors embossing folder. Vertical orientation. Works best with heavyweight cardstock. Fits most embossing machines. Folder measures 4.25 x 5.75 inches. 1 embossing folder per package. 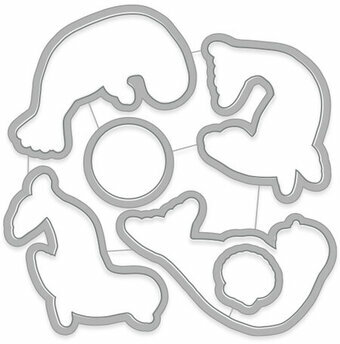 This Die-namics coordinates with the Just Beclaws stamp set for perfectly sized die cuts every time. It is open inside to allow you to stamp then cut OR cut then stamp. This feature makes the Die-namics lighter weight and allows for easier removal from the die. We've also included a sand die to add subtle pinpricks of sand to your beachy scenes. This 10 piece set includes: crabs (2) 2 1/4" x 1 3/8", 1 5/8" x 1", seagull 1 1/8" x 11/16", umbrella 2 1/2" x 2 1/2", star 5/8" x 5/8", heart 1/2" x 1/2", shell 9/16" x 9/16", ice cream cone 1/2" x 7/8", popsicle 1/2" x 3/4", sand 1 1/4" x 3/8". 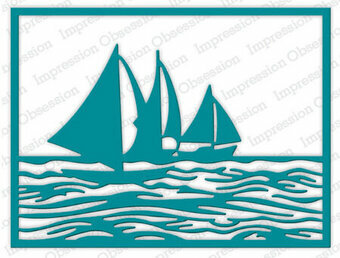 Impression Obsession craft die featuring a lighthouse by the ocean. This is a single die measuring 3-3/4 x 5 inches. These are US-made steel dies compatible with most table-top die cutting machines. Liquid Pearls are a versatile, waterproof pearlescent paint designed especially for decorating paper and fabric. The bottle's built-in easy flow tip is handy to use as a dimensional paint to accent scrapbook pages, cards and mixed-media artwork. Hand-washable, the paints are ideal for fabric applications such as wearable art, quilting and home decor projects. New brilliant pearlescent formula. Hand-washable on fabric. Acid free, non-toxic. Non-settling formula. Easy-flow tip in a .5 oz bottle.